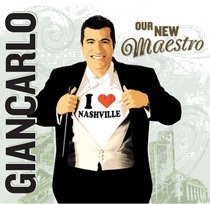 "One of the biggest goals of this orchestra is to open it to everybody"
La Hacienda ad: "Gracias, Maestro"
Nicaragua-born and Costa Rica-raised Giancarlo Guerrero, the new director of the Nashville Symphony, is the star of a popular series of playful ads that take the Maestro beyond the typical symphony surroundings and into Middle Tennessee landmarks like La Hacienda, Tootsies, historic downtown Franklin, and the Bicentennial Mall. The Tennessean reported here on the ads and quoted Guerrero as saying, "One of the biggest goals of this orchestra is to open it to everybody." Single-concert ticket sales are up 50% over last year, according to figures published in the Tennessean. The ads have been placed on YouTube and elsewhere and are featured below. In the ad filmed at La Hacienda, both a restaurant customer and Guerrero speak a little Spanish.